No major project or initiative can be undertaken in a closed box by an individual and there would always be a number of people associated with it. A simple activity to go on a trip too may involve many associated entities including the booking agent, taxi drivers, hotels, tour guide, your parents (if they are financing or you need to take their go ahead) etc. When you have complex projects with large scope and high stakes managing your stakeholders gains much more importance. Key players or stakeholders may expect or even be entitled to exercise involvement with the activities of the project. As they may eventually judge the result they obviously should have a role in formulating the criteria for project success. It is important to timely acknowledge the stakeholder’s needs during project start-up. But as projects often include contradictory interest, compromises must be made to reach general consensus. Communication and the exchange of opinions, interests and expectations are of the utmost importance. In practice some issues rise when trying to facilitate this process; which stakeholders need to be contacted and which level of involvement is desirable. So an analysis at the early process stage is needed before interests become entrenched or feelings of exclusion rise. It is critical that project managers undertake a systematic approach at the onset of a project to ascertain who the potential stakeholders are and what role could be assigned to each of them. First and foremost in managing something is to identify what needs to be managed. Hence it is important that before initiating a project implementation, it is critical to identify the stakeholders during the planning stages itself. Post identification, project managers should reach out to them and initiate discussions. This would on one hand give them a notification about intended project and on other provide an opportunity to seek their inputs. This opportunity should be leveraged to identify their views about the objectives of the project and tentative implementation plan. Their opinion and experiences should be invited to make the project plan robust enough to handle eventualities. Also it would help to ask them to be a part of the project and play a crucial role towards its success. Happy, informed, positive stakeholders will make it a lot easier to deliver the project successfully. 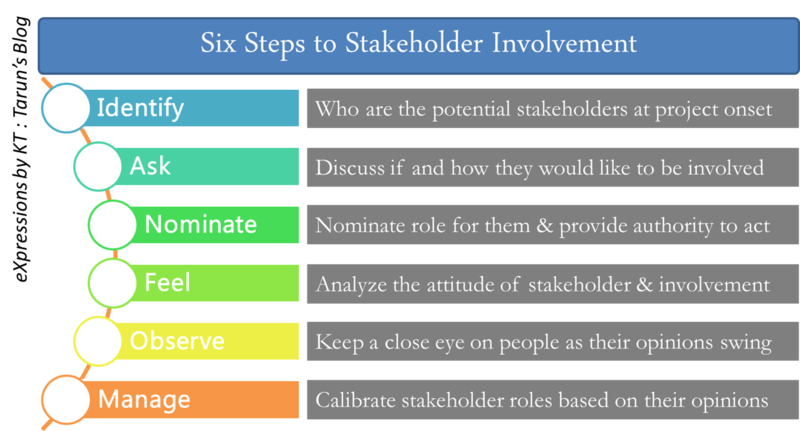 Once discussions are completed, stakeholder capabilities should be assessed and roles should be assigned for each of the stakeholder willing to be involved with the project. Relevant authority should be given to the stakeholders that would enable them to undertake the assigned roles. Stakeholder management is not a one-time activity but a continuous process that should be undertaken throughout the project duration. It is responsibility of the project managers to keep in touch with the stakeholders and keep a tab on their attitudes. It is important to keep a close eye on people as their opinions will swing between positive and negative over the life of a project. Managers should conduct regular touch points with stakeholders and take their views on the project progress. Key to stakeholder management is to try to gain their trust by keeping them updated with the project progress and take their views into consideration. One of the key stakeholders for any project is those who are at helm of affairs whose involvement is critical for project success. Whether they are your parents who would provide the go-ahead for the trip or your boss who will provide the driving force for a client engagement – their buy in and support is foundation to project implementation. Project management is unlikely to succeed unless there is any visible support and commitment by executive management. When employees and the project team see the interest, support and commitment of the organization’s senior management, they will have a sharper focus. This support and commitment can be described in two subtopics; project sponsorship and life-cycle management. The role of the sponsor is to manage interference that exist for the project manager besides continuously remind project team that only performance at the highest standards of excellence are acceptable. It is important that company goals, objectives and values be well understood by all members of the project team throughout the life-cycle of the project. Ongoing and positive executive involvement, in a leadership capacity will reflect executive management’s commitment to project management. A set of important stakeholders often ignored during project planning are the vendors and service providers. The project manager and the procurement department are responsible for managing relationships with vendors. They should ensure timely delivery and high quality of products and communicate with vendors by arranging weekly meetings with each vendor, in order to discuss current progress of each ordered product. This is core of the vendor management. Vendor management is a set of activities that allow ensuring that the chosen vendors provide the procurement items according to the delivery schedule and that appropriate levels of quality are maintained. Managing stakeholders effectively would help remove the hurdles in project implementation which could otherwise become a threat to the success. Project managers need to understand the importance of this aspect and incorporate it into their planning to ensure that such irritants are smoothed at the project onset itself. I have seen in my projects that if all those who could have any stake in it are involved early on, they are more willing to contribute during the execution and help in solving an unanticipated problem which may come up at later stages. Hope my experiences help some of the project manager in their engagements. Do pour in if you have experiences supporting or contradicting the views on the article. Drop in a word if you would like to discuss these further in detail.